It seems like every time I talk to clients, audiences, and friends about the “best of” winter foods, my first choice is always winter squash. There are so many wonderful varieties – butternut, acorn, delicata, etc. Each has its own unique flavors and textures, but the are all among my favorite easy and versatile winter foods. I often will roast some squash when I’m cooking something else in the oven, even if I don’t know quite how I’ll use it. Once it’s ready, a great idea usually pops into my head! 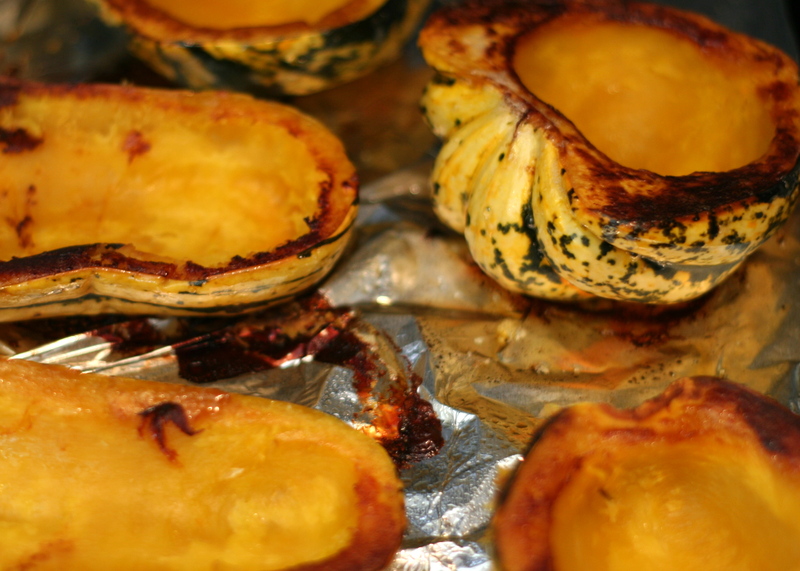 Roasting winter squash is so simple. First, set your oven to 375°. Then line a cookie sheet out with aluminum foil for easy clean-up. Grease the foil with whatever your preference is – oil or cooking spray. Now cut your squash in half lengthwise. Delicata and acorn squash are often relatively small, and will likely only need one cut. A butternut squash can be cut so the bulb separates from the neck first, and then cut lengthwise. Next scoop out all the seeds. Take some olive oil and drizzle it into the cavity where the seeds were. You’ll want to spread it out in the thin layer over the cut surface of the squash. I typically use a pastry brush, but a spoon or clean fingers work just as well. Put the squash halves on the greased cookie sheet with the cut side down. Roast in the oven for 30-60 minutes depending on thickness of the squash. You’ll need to check it at 30 minutes to be sure. If you can easily put a fork through the outer skin of the squash, it’s done. If not, then just leave it in the oven a bit longer. 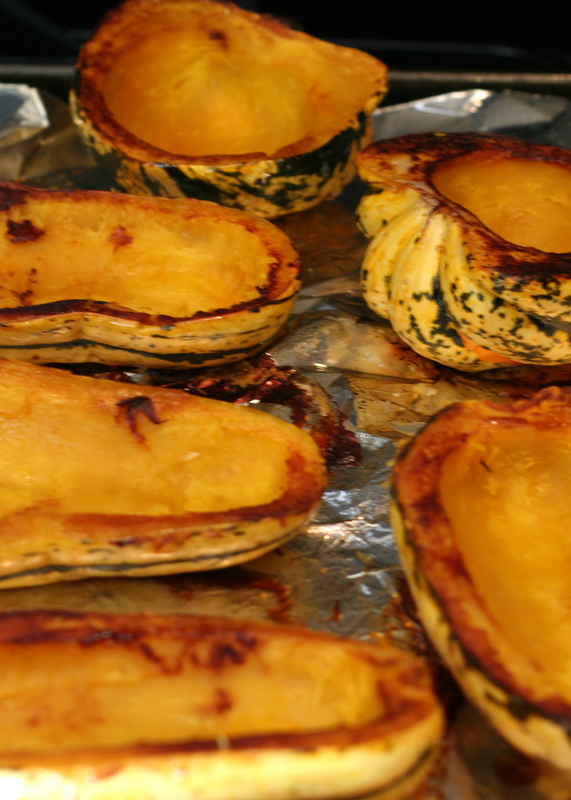 You may see some that the squash has carmelized around the edges – this is a good thing as long as it’s not too black. Roasted winter squash can be cubed into a soup recipe. It can be eaten as is within the shell – I typically add butter and salt to the cavity before serving. It can also be scooped out and mashed with seasonings for serving as a puree of sorts. Experiment and let me know what you’ve tried! Especialy with Acorn Squash, I use brown sugar, butter and a sprinkle of nutmeg in the cavity, and stick it under the broiler for a couple of minutes.Butternut I just mash with a bit of herbs( usually a mix of Fines Herbes)and butter. ilove all squash.